Oklahoma's offense is beginning to take off and I don't think that the strong defense of the Wildcats will slow them down. This will be a fun shootout in Lubbock but while Tech is terrible defensively, the Mountaineers aren't that bad. Hope you are a fan of the running game. It is never easy to go into Neyland Stadium and win but I still don't have that much confidence in the Vols that they can pull off a big upset here. 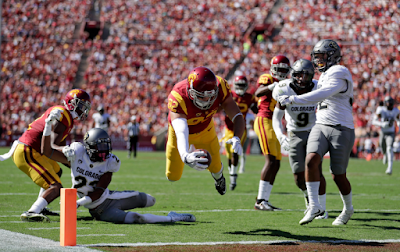 I'm not certain that Clay Helton has fully stabilized things but things are looking better for the Trojans. Meanwhile, Arizona is a mess. UNC looked bad against Virginia Tech and that was a little disheartening. The Canes, meanwhile, blew a winnable game against Florida State but I did see enough to believe that this team is legitimate. The Hoosiers have already pulled off an upset at home against Michigan State but now we've found out that the Spartans really aren't that good. They'll keep it close against the Cornhuskers but they'll fall short. The Demon Deacons are legitimate and legitimately good but not good enough to go into Tallahassee and take out a rejuvenated Florida State squad. As I just said, I think we've realized that the Spartans aren't that good. Having said that, it still would be a surprise to see them lose to Northwestern in East Lansing. Anybody know what happened to NIU? Boy, have they fallen off. SEC football under the lights is always fun and this be no different. Arkansas weren't able to push Alabama that hard but at least they don't get the best team in the nation here. That said, the offense of the Rebels will prove to be the difference. Yeah, both of these two have gone south. I can't fault Notre Dame that much considering the dreadful weather in Raleigh but I don't think I can bet on this team at all right now. Both teams here are better than I thought before the season but while Wisconsin has looked good, Ohio State looks tremendous and like an elite championship contender. The Buckeyes will show that in a big win Saturday night in Madison. Considering how badly they just defeated the Cardinal at home, I think it is safe to say this Washington State team is not the same that lost to Eastern Washington in the opener. I don't think they'll open up as big of a can on the Bruins but I do think a strong Luke Falk performance will key the Cougars here.